Children across the school were immersed in the Ghanaian spirt on Wednesday 20th March as we were joined by Kwaku who taught the children about his culture and provided opportunities to partake in Djembe drumming and African printing. A fantastic experience which was thoroughly enjoyed by all. Friday Bridge Primary School wore it red on Friday 15th March to raise funds and awareness of Comic Relief and the charities supported by this event. In total we raised £87.43. Thank you all for your donations. Mary Poppins, Alice in Wonderland, The Smartest Giant in Town, Stick Man and many other characters from our favourite stories joined us today to celebrate World Book Day. 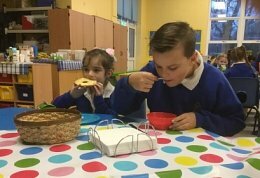 Children enjoyed the opportunity to ‘Share a Story’ with children from other classes over a delicious Bagel Brunch and took part in exciting story inspired activities in their classrooms. A Happy World Book Day was enjoyed by all. Ducklings have enjoyed sharing stories with Kestrel class and had a Bagel Brunch too. In class we listened to the story Aliens Love Underpants, designed our own alien and wrote a character description. Robins and Ducklings had an afternoon together where we could tell stories using puppets, make our own books and bookmarks. A wonderful day was had by all. 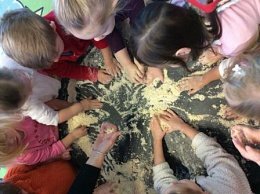 Children at the Jack & Jill Playgroup are busy enjoying messy play. Jack & Jill’s is a small, friendly village playgroup. They are based on our school premises with well established links ensuring children have a smooth transition into our Reception Class. They are open Monday – Friday during term times and can be contacted on 07426 979350. Breakfast Club began in September 2018 and is growing in popularity. Mrs Wiffen serves tasty food including bagels, porridge and fresh fruit. Hot chocolate, milk or fruit juice are available. When children have eaten they can warm up their brains by participating in a range of games and activities. All children are welcome at Breakfast Club; please contact the office for more details. Kestrels Class were very busy before Christmas and each made a very glittery card for Her Majesty The Queen for Christmas. We sent these off to Buckingham Palace at the end of last term. We have received a very special reply from Sandringham House (the Queen’s home at Christmas). 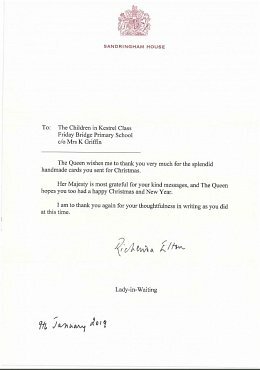 It was a very kind letter thanking the Children for their thoughts and wishes from the Queen, written by her Lady-in-Waiting. We have framed this extremely special letter and it is now on display with our British Values so that all of the children at Friday Bridge can enjoy it. 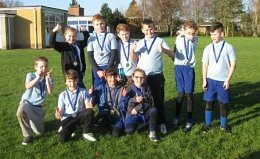 On Friday 30th November a team from Years 5 and 6 took part in a Tag Rugby Festival held at St Peters C of E School in Wisbech. The mixed team consisted of 10 pupils with 8 on the pitch at any one time, playing against Kinderley and St Peters. It was the first time the team had played together and they worked extremely well, passing the ball to each other and defending their area by getting the Tags off the other teams. A great morning was had by all and we came away as winners by one try! Children and Staff came dressed in spotty or colourful clothing with some wonderful wacky hairstyles on display! Together with Jack & Jill Playgroup we raised £133 for Children in Need. Thank You! A wonderful time was had by children and adults at Grafham Water. It was great to see the care the children had for each other. They were superstars! We scaled the heights of the High Ropes and had a splashing time canoeing and sailing. During our time we were taught how to light a fire and needed to work as a team to make our own shelter. In the evening we passed the time with chess and chequers or chatting to our friends. Hot chocolate was on the menu to finish our day. The food was delicious and enjoyed by all! We remembered to thank the staff for a fabulous time. We would like to thank all of our families for their generosity at our Harvest Festival. All donations have been given to the local foodbank and we were lucky to be joined by Bryan from the Wisbech branch at our Harvest Assembly where, led by the School Council, each class presented some of their recent learning about Harvest. Children of Friday Bridge Primary School ended the year in style with a fabulous whole school production of ‘All for 1,2,3,4’. Led by Karl Gernert of Act II Theatre Company, children from Reception to Year 6 dazzled in 80’s inspired costumes to perform well known hits including ‘Don’t Stop Believin’’, ‘You Can Go Your Own Way’ and ‘I Love Rock and Roll’… Even the staff took to the stage to perform ‘Nothing’s Gonna Stop Us’. ‘All for 1,2,3,4’, written by Charlotte Gernert, tells the story of Dana Tanian (played by the talented Grace – Year 5) as she pursues her dreams of joining the famous rock band-The Musketeers- whilst foiling plots against her from rival group Cardinal Sin, led by Lady Winter (Poppie – Year 6). All principal characters produced outstanding performances and when the whole company performed the opening and closing songs they really did raise the roof of Friday Bridge Primary School! Year 1 had a fantastic day at Wisbech Reads and thoroughly enjoyed taking part in lots of different activities. We met the author Ellie Sandall and joined in with her as she read us one of her books. We spent some time in the Library and Museum and had our picnic lunch in the beautiful castle grounds. Everyone was presented with a certificate for taking part as well as a bag full of goodies including a book written by Ellie Sandall. We are all hoping we can go again next year! Class 1 and 2 had an amazing time at Bewilderwood for their summer outing. Everyone was very excited to go on the boat ride although Mildred the crocodile gave quite a few of us a shock when she squirted water in the air! We all enjoyed climbing at the Sky Maze and Twiglet village. The fantastic slides proved very popular with lots of us whooshing down the slippery slopes! Thank you to everyone who supported our Fantastic Summer Fayre! The weather was glorious and it was lovely to welcome so many members of our school and local community to enjoy all that was on offer, from the bouncy castle to entertainment from a local dance and gymnastics club and our own choir and samba group plus traditional stalls including hook-a-duck and tombola. We have raised an amazing £725 for our school funds! On Tuesday 5th June, Class 3 & 4 had a fantastic trip to The Space Centre, Leicester. Here, the universe came to life through the amazing exhibits and activities which we took part in. On 15th June children from Reception to Year 6 took part in this year’s school’s Race for Life. Following a warm up, each child completed a minimum of 5 circuits of the school field – earning a medal each, increasing awareness of Cancer Research and the work which they do and raising an amazing £381!!! Children and staff came to school in their sportiest outfits, trainers at the ready, in aid of Sport Relief. School Council organised a daily mile for all to complete, either running or walking! A great way to burn off some energy in aid of a fantastic cause! Thursday 1st March – we were joined by book characters from across the world of children’s literature. From Where’s Wally to the Mad Hatter and from Belle to Gangsta Granny children (and staff) dressed up to celebrate World Book Day. Many children enjoyed sharing their favourite stories with their friends and had the opportunity to join in a book swap. The event was greatly enjoyed by all! On World Book Day, Class 1 enjoyed sharing books with Class 4. We listened to the story Snail and the Whale and had a visit from Sheldon, the Giant African Land Snail that lives in Class 2. During the day we enjoyed lots of book activities and stories. It was great! At 9:10 am on Friday 23rd February 2018, Wood Green Animal Charity came to Friday Bridge Primary School and gave an assembly for us. They told us the five qualities to help us look after our pets. The law believes we should give our pets a home, a healthy diet, companionship, the freedom to express normal behaviour and the correct vet care. Companionship- Love, friendship and care. Diet- A correct amount and a healthy diet. Normal Behaviour- The freedom to exercise and play. Vet Care- Regularly visit the vets for health check-ups. Home- Indoor: A warm, soft bed with a correct amount of space. Outdoor: A sheltered area, with a waterproof sleeping area. Both providing food and water. At 11 am Class 4 made their way to the hall. Waiting for us was a lady from Wood Green who was preparing two activities for us to take part in. Our first activity was to choose the correct objects to suit a rabbits needs. During this task, we had to select what we thought what was right for the rabbit. E.g. A clean spacious hutch, not with a constantly shut door. This was preferred to a small hutch with stale, old water and dirty floor. Followed by that, our second activity was to make a toy for rabbits using hay, cardboard tubes and a willow stick. Overall we thoroughly enjoyed our morning with Wood Green Animal Charity. We hope they visit again in the future. During Wood Green’s visit Class 3 did a group activity to determine what a rabbit should have in their hutch. They discussed different items of food and bedding to decide what was best left in the rabbit’s space or taken out. In Class 1 we made a home for Martha the mouse. We learnt about what the best bedding is and what food they like, and how to make it. We wrote thank you letters to Wood Green. In Class 1 we enjoyed making Teddy cookies, jam and honey sandwiches for the picnic. In the afternoon parents joined us to look at our work and share a story whilst enjoying sandwiches and cookies followed by squash. On Friday 2nd February we had great fun raising funds for the NSPCC by taking part in their annual ‘Number Day’. 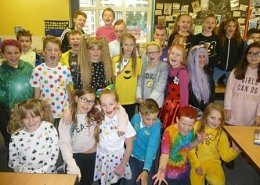 Staff and pupils were encouraged to ‘dress up for digits’ and throughout the day the children took part in special maths activities. The day ended by Class 4 running a ‘Ratio Refectory’ for the children and their parents to attend. It was hugely successful and I’d like to say a massive thanks to everyone who took part and supported our fundraising day. As part of Number Day in Class 1 we have been painting Chinese Numbers. We have followed a recipe and measured ingredients to make cupcakes. We are making Chinese Lanterns and learning that they are a cylinder shape. We are also making different lengths of Chinese dragons and writing about Chinese New Year. Children and staff were delighted to be joined by David Butterworth and his guide dog, Oona – a German Shepherd. David explained how guide dogs were trained and their jobs as well as sharing some of his experiences with Oona. Children were fascinated to see how well Oona responded to commands and enjoyed watching how she assisted David and fulfilled her guide dog duties. We were even lucky enough to have the opportunity to give Oona some attention – she certainly enjoyed all of the fuss! Today we were joined by author, Sarah Hindmarsh, who has written several children’s books including The squirrel who travelled the world. Sarah led an assembly where all pupils were able to quiz her about her writing experiences and journey to being an author. She then worked with each class leading workshops on character development and creative writing. 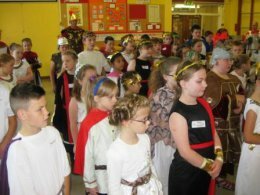 Class 3 and 4 were transported back to ancient Greece partaking in a range of exciting activities to immerse themselves into Grecian lifestyle. This included tasting Mediterranean foods, dramatizing stories of the Gods and performing the most famous Greek dance routine, the Zorba. During Maths week, Class 4 challenged themselves to: learn their seven times tables using a variety of strategies; solve tricky ‘Maths Talk’ questions; and create some rather complicated Christmas tree decorations. It was super to see so many parents on the Wednesday so that the children could share all they had been learning. Class 2 had fun sharing lots of different Maths activities with their parents. They played Maths games, weighed play dough and investigated Russian Dolls. Shape activities included making a Cone Santa and seeing if it was possible to make a teddy using only circles. An Estimation zone was popular, with parents and children guessing how many snowflakes were in a jar and estimating then measuring scarves. Class 1 shared their Maths learning with parents in an Open Session during Maths Week. It was Christmas themed and gave lots of ideas for Maths at home too! On Christmas Party afternoon we had lots of fun decorating biscuits. There were some brilliant designs such as Christmas trees and a person wearing headphones. Class 1 and Class 2 enjoyed making decorations for the tree at St Mark’s Church. We went to help decorate the tree, sing songs and enjoyed a treat of fruit and biscuits. A super afternoon for all. Class 1 and Class 2 have been busy making Christmas decorations for St Mark’s church; ready for when we decorate it on 6th December. Reception and Year 1 shared Phonics Open Sessions with their parents. The children showed the grown ups how to say the sounds and had fun doing lots of phonic activities. Every Friday, we take part in Reading Buddies. This is when Class 4 read with a ‘buddy’ in Class 2 (and some of Class 1). It is a lot of fun and helps them to learn challenging words. We spend about 20 minutes which is a sensible amount of time to learn to read. We have been learning about why we have Children in Need and had a quacking time dressing up as ducks. We wrote about how we helped. In class we made some bunting, did careful colouring and Maths by counting spots on the cakes. A fun day for a great reason. These minor celebrities -who had been on the local news – were attending our school as part of their abstract art project. Since we had no idea this was going to take place, Class 4 excitedly yet gingerly entered the hall. Here, is where it all happened. Firstly, we were seated, on mats, in front of a huge green and blue painting. It was like nothing I’d seen before. If I’m being completely honest, I thought it was just a bunch of wiggly lines – nothing that impressive! Before I had chance to analyse the painting further, Tim Mann (the project’s lead artist) introduced himself. He also introduced his sidekick Brandon. He asked us to consider ‘What makes us human?’ After a short discussion, we agreed it was our ability to feel empathy. Unexpectedly, Tim then pulled Grace out of the crowd to participate in the project. She had to stand in front of the chalk pastel drawing (not a painting!) whilst Tim swiftly drew round her. Bizarrely, she had to shout her name as loud as she could to represent how important she is. Not long after that, we all had a go. For the rest of the session, we discussed the meaning of the drawing and what it symbolised. We also completed a mini art project. Overall we had a fantastic morning and can’t wait to see the final piece exhibited in the Wisbech Museum. Class 1 enjoyed being part of the Crowded Room Project. Standing and being chalked around and having to shout out their name as loudly as possible was great! They drew around their hands and passed the drawing around the circle. Class 1 had a super time, thank you Tim Mann and Brandon. Class 2 also took part in the art project run by Tim Mann. As a celebration of the wide community in Wisbech Tim drew around each child to add to a large portrait. His ambition was to celebrate each individual in Wisbech and their place within their richly diverse town. FBPS was the last place he visited and after all classes had participated, he had topped 10,000 participants. The children also drew around their hands, passing papers around so every child had a piece of paper showing their whole class. With Class 3, Tim drew their outline on the board. As each child stood in front of the board they said their name as loudly, or as softly, as they wished. Next, sitting in a circle, they drew around their hand on a sheet of paper before passing on the picture to someone else and receiving one from their neighbour. Eventually their original picture returned to them, with the outline of everyone else added to theirs. Tim said we were the last class to take part, we counted up to and beyond the 10,000 people mark – Class 3 were very excited by this. See separate news item from Class 4. As an introduction to a Topic all about Toys the children in Class 2 were invited to participate in a Hobby Horse Gymkhana. Hard hats were worn and rules carefully explained. The horses were very well behaved, jumping over small jumps and many children achieved a clear round! Everyone had an amazing time and thoroughly enjoyed it. A huge thank you to Hayley for organising and running the event. Just before half term Class 2 held a bird exhibition to share all the learning that had taken place over the previous weeks. They showed parents the model birds they had made and explained all about them. Topic books and English books were shared and it was lovely to see so many parents attending. On Monday 30th October 2017 the majority of Class 4, and some of Class 3, had the pleasure of attending a performance at the Thomas Clarkson Academy (TCA). M&M Productions performed Pinocchio, which took place in the theatre of TCA. It was a fantastic way to begin a new half term. Even though it was a small cast, it was as excellent as it would have been if they had one person per character. They story was about Jeppetto wishing for his wooden puppet to become his one and only child. The Blue Fairy bought Pinocchio to life and fulfilled Jeppetto’s dreams. My favourite part was when Silly Simon was leaning against Pinocchio then, all of a sudden; they got stuck in a scream loop. Also, Miss Fitzpatrick got pulled up to the front to dance. I would watch it again because it was very funny. We also sang along to songs such as Happy, Uptown Funk, Power and Shout Out to my Ex! Overall, we had a great morning. M&M Productions do amazing performances not only for children but also for adults – I would definitely recommend them! Twenty four children and three adults attended Grafham Water Centre this year and a fantastic time was had by all. Both children and adults thoroughly enjoyed their visit and all arrived home on the Friday completely exhausted. We took part in the usual range of water activities and this year completed the 10km cycle ride around the lake. Mr Pallett, Mrs Riley and Mrs Davis were very proud of the effort, achievement and effort of all the children involved. Class 1 have been learning about dinosaurs this half-term. We have been on a Dinosaur Hunt through a forest and mud (school field) and found a T-Rex. In our outdoor area, we have enjoyed a dinosaur dig; there were very large bones that we discovered and talked about. Investigating the ice dinosaur eggs helped us learn about melting of ice and how it returned to water. In English, we have created our own information books after learning lots of facts about different dinosaurs such as a T-Rex being a carnivore and a Brontosaurus being a herbivore. We have also listened to lots of dinosaur stories and poems and created our own. This half-term we also visited the local church as part of Harvest Festival and sang songs. We decorated the font and windowsills with things we had made too. Class 1 enjoyed a visit from the Fire Service on Thursday 20th July. They learnt about the equipment on a Fire Engine and how it is used. The firefighters explained about the different clothes that are worn to fires and to rescue people from the water. It was fantastic! Friday Bridge Primary School are delighted to be awarded the British Council’s International School Award (Intermediate Level). All classes have been involved in establishing links locally, nationally and internationally. Class 2 have linked with Downside Primary School in Luton. Class 3 have continued their involvement with the ‘Along the A47’ project and Mayflower Primary School, Leicester, and Marshland St James Primary School. Class 4 developed their ‘European Newsroom’ project with schools in Finland and Italy, for which they received an eTwinning Quality Label. Class 4 also linked with St Coleman’s School, Kanturk, near Cork in Southern Ireland, through the ‘100 Word Challenge’. Finally, the whole school were involved in the eTwinning project, ‘Loving Laughing’ which involved 22 European schools. FBPS is anticipating developing more international projects in the 2017-2018 school year. Class 4 have been linked with Mrs Boyce’s Class through the 100WC. They have written items and commented on each other’s work. There have been improvements for everyone. Mr Hales visited the Irish school recently. He took a post from each child in Class 4, who are looking forward to replies! Mrs Boyce’s Class compiled a book of 100WC writing for the Class 4 library. Class 3 welcomed their friends from Class 3CR at Mayflower Primary School, Leicester. They had time playing together, as well as visits to St Mark’s Church and the local fruit farm. There will be a return visit when the children will share the adventure stories they have been writing. All classes learned about improving their Road Safety, when they worked with Mick and Paul from GIST Transport, who deliver for Marks and Spencer and Starbucks. The children learnt about being safe when lorries pass them on the pavement, about being visible to the driver and crossing the road safely. The children had an opportunity to climb in the driver’s cabin. Class 2 were putting their best welly forward this week, when they held their Welly Walk for the Farm Africa charity. They have been thinking about Drought and Famine in the world. They found that Farm Africa helps families in Africa help themselves by improving their skills in growing crops and having access to water. Unfortunately, the Welly Walk took place in the school hall because of the wet and windy weather, but £40 was raised for Farm Africa. After ten lessons of learning some simple Italian, Letaya came up with the idea that Class 4 should hold a Pizza Party. So all the children made their own mini pizzas using muffins and ingredients like passata, peppers, sweet corn, chorizo and mozzarella cheese. They also made Italian flags and completed Italian quizzes. Buon appetito! Again within the theme of ‘Clothes’, a number of stories have been read including ‘The Emperor’s New Clothes’. This has led to extensions of the story with the children creating ‘Wanted’ posters when the Emperor went missing and writing postcards from the Emperor to the Palace saying where he was hiding. The children have used stick puppets to create their own stories. Friday afternoons have been a perfect end to the week for Classes 1 and 2, as they have taken part in energetic and creative Dance lessons with Kate. Many of the lessons in Class 2 in Spring A have been within the theme of ‘Clothes’ and Dance has been no exception. English and Dance have been combined with the story of ‘The Elves and the Shoemaker’. Class 3 were delighted to receive more postcards from their friends at Mayflower Primary School in Leicester. The cards gave lots of information about Leicester, including Leicester City Football Club, Leicester Tigers Rugby Club, the National Space Centre and King Richard III. Class 3 will be writing postcards about Wisbech after February half term. Having held Key Stage 2 auditions, Charlie, Ollie, Grace and Saskia were chosen to perform their jokes in a film being made by the staff and 6th Formers of the Media Department at the Thomas Clarkson Academy. The children designed their own costumes matched to their joke. When completed, the film will be loaded on the eTwinning ‘Loving Laughing’ website along with 20 other European schools. Class 2 were very pleased to receive their notes from Penguin Class at Downside Primary School, Luton. In reply, the children have learnt about Diwali and sent ‘Happy Diwali’ cards to their friends. Children and staff were delighted to welcome Julia Skinner, founder of the 100 Word Challenge, to work with Key Stage 2 classes. 100WC is global initiative to encourage children to write for an audience and hopefully receive feedback. Julia worked with Class 4 on the 100 Word Challenge and with Class 3 on the Five Sentence Challenge. Julia also led a workshop for staff from Friday Bridge, Kinderley and Thomas Clarkson Academy. Plans are well advanced for our five school link projects. Class 2 are linking with Emperor Class (Y3) at Downside Primary School, Luton. Class 3 are working on the third year of their ‘Along the A47’ project with Mayflower Primary School, Leicester, and Marshland St James Primary School. Class 4 are starting a new eTwinning project called ‘European Newsroom’ with schools in Finland and Italy. Our Y6 Writers’ Club are using 100 Word Challenge to link globally, but with specific links with primary schools in Cork, Eire, and Dunedin, New Zealand. Finally, we hope to be part of the eTwinning project ‘Loving Laughing 2016/17’ with over 20 eTwinning schools and beyond, led by Mayflower Primary School. The main purposes are to celebrate the similarities and differences between our communities and to provide a context for digital literacy, particularly skills in English and Computing. On Tuesday 30th June 2016 we hosted our ‘Carnival of Sports’ in the morning. Everybody had a fantastic time watching and taking part in a variety of sporting challenges, finished off with some superb track events! Class 3 were delighted to welcome their visitors from Class 3JSC at Mayflower Primary School. The exchange visit came at the end of their ‘eTwinning’ project ‘Along the A47’. The children met their partners, as well as visiting St Mark’s Church and the fruit farm down Maltmas Drove. The return visit to Leicester takes place very soon. Would you like to attend the Ugly Bug Ball? Inspired by the song by Burl Ives, Class 2 have been writing in all kinds of ways – an invitation, an adventure story, a menu, some costumes and some games. At the Ball itself, there was dancing, singing, music-making and cheerleading. We were delighted to welcome Steve Smallman, an author and illustrator, who actually was born in Wisbech. Steve has written and illustrated many books which our children really enjoy. Steve visited each of our 4 classes, reading some of his stories and illustrating characters from the children’s ideas. Steve Smallman is Class 2’s Author of the Month and they have been enjoying reading books like ‘The Monkey with the Bright Blue Bottom’ and ‘Poo in the Zoo’. KS2 were set the challenge to build the tallest tower using newspaper, straws and tape. Various designs were attempted – some were more successful than others! The winners’ tower was taller than the tallest Year 6 boy! Class 2 set up a Toy Museum as part of their History topic. They wrote letters to family and friends and brought into school many different toys of all shapes and sizes from teddy bears to a pram. They wrote labels for each exhibit. One of the children was Museum Curator. They made tickets and badges for the visitors. All other classes came to visit the Toy Museum. Some of the children talked about their toys. All the children enjoyed their learning! 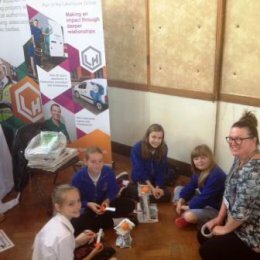 Year 6 were delighted to attend the 2015 Careers Convention, organised by the Wisbech Schools’ Partnership. The children toured the many stands and took part in different activities. They talked about the world of work and expressed interest in many jobs including a midwife, a professional rugby player, a stand-up comedian and joining the Royal Navy. Children from Class 3 and 4 visited Wells-next-the-Sea and Holkham Hall as stimulus for their North Norfolk topic. 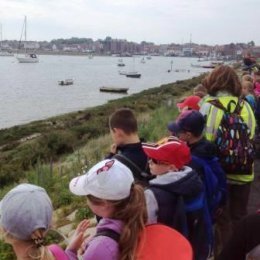 With the weather proving better than the forecast, the children walked from Wells Quay to the beach, looking at the high tide, the boats, the birds and the beach huts. It was then off to Holkham, where after a massive clap of thunder, lunch was eaten on the coach. The day finished with time on the adventure playground and a walk around the grounds to absorb the breathtaking views and the stunning architecture of the magnificent Holkham Hall. 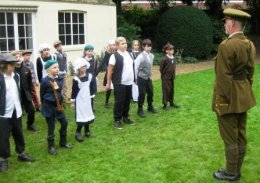 Both Class 3 and Class 4 continued to learn more about World War One with their visit to Wisbech Castle. They experienced many activities like Marching, Signalling using semaphore, First Aid, Washing bandages, WW1 Toys and Making poppies. The day finished with a minute’s silence at the War Memorial.